The Carpet America Recovery Effort (CARE), the organization formed 16 years ago to minimize the amount of carpet that ends up in the nation’s landfills, has been working furiously to meet its goals despite ongoing headwinds. CARE recently held its annual conference where it released its latest report. To date, the total amount of post-consumer carpet diverted from landfills equals five billion pounds. Of that total, 394 million pounds were diverted in 2017, down 19% from 489 million pounds in 2016. 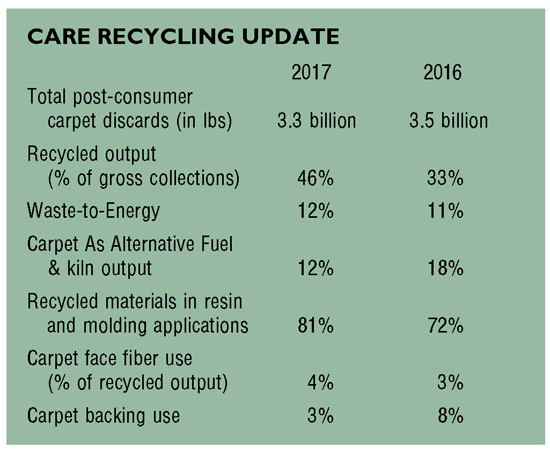 In 2016, California’s Carpet Stewardship Program’s recycling goal was 16% of total post-consumer carpet discards, though CARE fell short at 11%. But in 2017, CARE improved, rising to 14%, while the rate for the rest of the U.S. saw a 70% decrease-the national average is 5%. However, CARE is optimistic that the recycling rates will climb due to an improving economy, rising oil prices and new technologies that will allow it to grow new outlets for post-consumer face fiber. CARE’s annual report reflects the challenges it has faced as well as its efforts to meet its goal-with some declines and some gains. CARE manages three operations: the California Carpet Stewardship Program, the Voluntary Product Stewardship Program and CARE Core Operations. CARE’s total budget between all three operations comes to approximately $30 million for 2017, with California’s recycling fees contributing a large portion of the total. According to the 2017 report, the California Carpet Stewardship Program invested $16.5 million in subsidies, grants and other incentives to support recycling efforts in California. Further contributing to the program goals was $2 million worth of grants awarded in 2016-to support capital investments and product testing-that increased California’s recycling capacity by roughly 30% and created over a dozen new jobs. Additionally, three new pilot subsidies were adopted-for carpet tile collection, Tier 2 nylon 6 recycled products and commercial broadloom. Additionally, the number of CARE-supported drop-off sites grew to 44 in 2017, up from 33 in 2016-a 30% increase. However, it was also reported that Carpet As Alternative Fuel and kiln subsidies have been discontinued. CSEs, facing a shift in demand for recycled fiber material, have had to be more selective in the material that is accepted by their facilities, causing a reduction in the total gross collection. More specifically, the decrease in demand for nylon 6 combined with a decrease in price for recycled polyurethane foam pad has dried up the revenue stream that typically offsets the losses experienced during the collection and sorting of carpet. Data from VPS participants (covering all states except for California) reveals that reclaimed nylon 6 stood at 45% output (shipped and sold by collectors) in Q1 and dropped to 36% in Q4. Nylon 6,6 was at 25% in Q1 for output and dropped to 23% by Q4. CARE reports that the demand will most likely continue into 2018, but the amount of material in the waste stream will continue to decline. PET, however, was up three points from 2016 at 24%. CARE reports that “there is still no economically viable option for polyester fiber.” This is something CARE is working on, but it is worth noting that under the AB 2398 program, a subsidy is being offered for non-nylon material, which has increased the amount of PET collected. In Q1, PET was at 21% output and grew to 26% by Q4. Over the last few years, CARE and CalRecycle have struggled to establish assessments and subsidies for California due to uncontrollable variables, from falling crude oil prices to limitations in recycling technology to a reduction in recycled material outlets. However, rising housing prices and declining unemployment rates are just some of the indicators that the U.S. economy is recuperating following the 2009 recession. A healthy economy is certainly a necessary ingredient that could lead to gains in recycling rates for CARE. Low crude oil prices over the last few years have impacted demand for recycled materials by lowering the price of virgin materials. The good news-for those in the carpet recycling business-is that oil has been rising over the last year or so. According to Peoples, the cost of oil needs to be in the $80 to $85 per barrel range in order to see an increase in demand for recycled materials. It currently stands at just over $71 a barrel. CARE’s DoubleGreen marketing program, designed to encourage the use of California-derived post-consumer carpet content along with additional post-consumer content material, was expanded in 2017. This program is an opportunity to push products that had little to no value in the recycling stream, like calcium carbonate. Combining items like recycled tires with calcium carbonate to produce rubber mats is one example of how this program works. In addition to the caprolactam plants, China created the National Sword program, which is designed to stop the flow of waste materials into China. While CARE sees relatively little carpet going to China, other plastic commodities are now being forced to compete for some of the outlets that carpet was trying to service. CARE recently came under fire for its lack of compliance for years 2013, 2014 and 2015 despite the fact that California is struggling to maintain its other recycling efforts. CARE’s retroactively applied fine began at $3.25 million. CARE attempted a negotiation but was unsuccessful. The case then went in front of an administrative law judge who ruled that the fine would be $1.25 million. According to Peoples, the judge found no negligence on the part of CARE, so CalRecycle accepted the decision. It was discovered that the wrong fines had been applied, so the director of CalRecycle adjusted it down to $821,250 to be in line with statutory fine levels. With such heavily impacting changes happening in a short amount of time, Peoples sees the next four to five years as the time for the global recycle commodity marketplace to work hard to figure out how to place recycling infrastructure in Europe and North America. Currently, recycling operations have been put into motion or are in the works to accommodate both types of nylon as well as PET. Aquafil’s Phoenix, Arizona recycling center was completed in 2017 with a second plant slated to launch in California late in Q4. It is designed to separate carpet completely as well as reclaim nylon 6 to ship to its depolymerization facility in Slovenia to turn it into new Econyl nylon 6. The company plans on recycling 16,000 tons of post-consumer carpet per year. Another California operation, XT Green, anticipates starting operations in late 2018 or early 2019. The facility, located in Rancho Cucamonga, was scheduled to open in early 2018, but ran into delays, in part because subcontractors are in short supply in the state. In phase one, it will recycle nylon carpet, both commercial and residential, expanding into PET carpet later on. Recycling rates are anticipated to be as high as 90% in the first phase of recycling with an annual capacity of 40 million pounds of post-consumer carpet. This will include calcium carbonate as well. XT Green’s patented technology will process the carpet underwater for a more complete deconstruction process. Star Chemical has developed a proprietary PET depolymerization technology. According to Peoples, the firm is awaiting final pre-manufacture notice approval from the EPA in order for production to begin, and it already has commercial capacity in place and plans to expand over the next few months. Production is expected to begin this summer.